This year’s meeting addressed pedagogy and academic freedom in the age of hate speech and “fake news,” and tackled ongoing issues of race and racism in the academy, the discipline of sociology, and SWS as an organization. 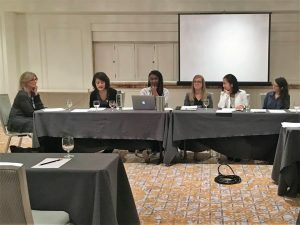 SWS President Adia Harvey Wingfield of Washington University in St. Louis convened plenary sessions on topics such as gender and precarious labor, feminism in the academy, and race, gender, and feminist activism. A contingent of feminist sociologists from UT Austin represented the department, with presentations that centered gender in varying ways. One highlight was a session that grew from Fem(me) Sem‘s Spring 2017 conference, “The Gender of Ethnography and the Ethnography of Gender,” which was organized by a group of sociology graduate students who were interested in using feminist methods in their research. 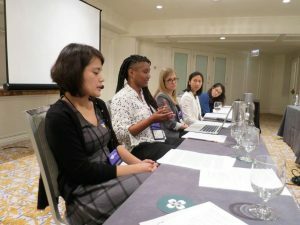 The session, called “Feminist Ethnographies: Dilemmas from the Field,” featured Professor Christine Williams as a discussant, and UT Austin graduate students Shannon Malone, Vrinda Marwah, Ruijie Peng, Beth Prosnitz, and Katie K. Rogers as panelists. They grappled with a number of questions related to feminist methods, including what exactly makes a research design “feminist,” how to manage demands for “proof” in response to situated knowledge, what it means to “gain access,” and how to reckon with accusations of “bias,” particularly with respect to projects that center a researcher’s own community (“me-search”) or emerge from explicitly feminist commitments. 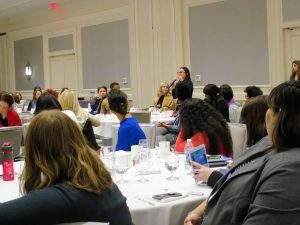 UT Austin also exhibited a presence among the individual paper presentations, with graduate scholars sharing feminist research on topics that ranged from intimate relationships to the gendered state to issues of gender, race, and labor. 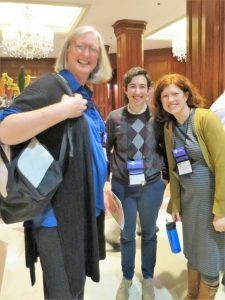 All told, the feminist scholarship and engagement of graduate students, alumni, and faculty affiliated with UT Austin Sociology helped make this year’s SWS conference an event to remember. Jamie O’Quinn is a second-year doctoral student in the Department of Sociology. Her research interests center around sexuality, gender, race and ethnicity, and social inequality. She is currently researching state efforts to regulate young people’s sexualities. Katie K. Rogers is a third-year doctoral student in the Department of Sociology at the University of Texas at Austin. Her current research examines how women who work in the U.S. legal cannabis industry reconfigure the meanings of “dealers” and “users” during legalization.